To demonstrate the feasibility of retrograde intrarenal surgery (RIRS) in the treatment of 2-3 cm multicalyceal kidney stones considering the possible complications and unsuitable situations. Multiple kidney stones are observed among 20-25% of patients seen in urology clinics. Percutaneous nephrolithotomy (PNL) is the primary method for treating kidney stones larger than 2 cm. Despite the high success rate achieved, life-threatening complications associated with PNL may arise. Multiple accesses may be required for multiple stones. RIRS has become increasingly widely used. In our study, we aimed to compare these two methods in the treatment of 2-3 cm multicalyceal stones. We retrospectively evaluated data of patients who presented with multicalyceal kidney stones measuring 2-3 cm between 2012 and 2016. A total of 64 patients who underwent surgery (36 RIRS, 28 PNL) were included in the study. Major complications were more common, operative time, fluoroscopy time and length of hospital stay time were longer in PNL group than in RIRS group. The number of stones was statistically higher in RIRS group. There was no statistically significant difference in other parameters. No statistically significant difference was found between the two groups in operation success rates. In the literature, the primary treatment option for 2-3 cm multicalyceal stones has been reported to be PNL. RIRS should be used in appropriate patients who have risks of complications related to anesthesia, bleeding disorder and patients with anatomic abnormalities who are not suitable for PNL. This method is also used to reduce the potential complications and it is more reliable. Considering the guidelines for the treatment of 2-3 cm multicalyceal kidney stones, the primary treatment is percutaneous nephrolithotomy, but when we considered possible multiple accesses, similar success rates, and higher rates of possible complications, retrograde intrarenal surgery can be used as the primary method that can be used in these patients. With the improvements in technology and techniques, retrograde intrarenal surgery (RIRS) has gained considerable popularity in the treatment of renal calculi. Initially, it was used for the management of small-sized (<2 cm) stones (1). Its usage has been widened with the growing experience and the innovations achieved in laser technology. Stones larger than 2 cm began to be treated with RIRS in suitable conditions (2). Multiple kidney stones are observed in 20-25% of patients (3). Percutaneous nephrolithotomy (PNL) is the primary method for treating kidney stones larger than 2 cm (4). Despite the high success rate achieved, life-threatening complications associated with PNL may arise. Multiple accesses may be required for multiple stones (5). Accordingly, renal parenchymal injury and bleeding might be seen and the postoperative comfort of the patient might decrease (6). RIRS can be used in patients having risk related with anesthesia, bleeding disorder and in patients with anatomic abnormalities who are not suitable for PNL. This method is also used to reduce the potential complications. In our study, we aimed to compare the efficiency and reliability of RIRS and PNL methods which are employed in the treatment of multicalyceal stones larger than 2-3 cm in our clinic. Data of the patients, who underwent PNL and RIRS procedures for kidney stones between 2012 and 2016 in the Urology Clinic at the University of Health Sciences, Dışkapı Yıldırım Beyazıt Training and Research Hospital were retrospectively evaluated. A total of 64 patients with multicalyceal stones measuring 2-3 cm were included in the study (36 RIRS, 28 PNL). Patients with bilateral kidney stones, ureteral stones accompanied by kidney stones and those who did not have computed tomography (CT) images were excluded from the study. The patients were informed about the treatment methods. The council, which consisted of the authors of this study, decided to apply RIRS (group 1) and PNL (group 2). While making this decision, history of antiplatelet treatment, presence of obesity which makes prone positioning of the patient difficult, and preferences of the surgeon and the patient were taken into consideration. Demographic and operative data of the patients were examined. Preoperative complete blood count, serum biochemistry, coagulation profile, urinalysis and urine culture as well as sensitivity tests of all patients were obtained. All the patients had preoperative sterile urine culture. Stone burden was calculated in all patients using the longest diameter of each stone on kidney ureter bladder (KUB) graphy and ultrasonography (US) for opaque and non-opaque stones, respectively. The total stone burden was calculated as the sum of each stone size. If any, intravenous urography and CT of the patients were also taken into account. Prior to the procedure, written informed consent was obtained from all patients. The operations were performed by the same surgical team in the same clinic. A 7.5 French (Fr) flexible uretero-renoscope (Flex-X2; Karl Storz, Tuttlingen, Germany) was used in RIRS procedure. A semi-rigid uretero-renoscope was inserted into the ureter and a 0.035-0.038 inch hydrophilic safety guidewire was placed under fluoroscopic guidance with the patient under general anesthesia in a modified supine position. This procedure also helped us achieve urethral dilation. Later, a 9.5-11.5 Fr or 11-13 Fr access sheath (Elit Flex, Ankara, Turkiye) was placed over a hydrophilic guidewire. When an access sheath was not placed, the flexible uretero-renoscope was moved using the safety guidewire and the kidney was accessed. When the stone was reached, fragmentation was performed via a 200 mm holmium:yttrium-aluminum-garnet laser probe (Dornier Medilas H20; Medtech, Munich, Germany). During the procedure, 8-10 hertz frequency and 1.2-1.5 joule power were used. Fragmentation or dusting methods were used according to the preference of the surgeon. In line with the intraoperative conditions, a JJ stent was placed. The time from the beginning of the endoscopy until the placement of the JJ stent was calculated as the operative time. In PNL procedure, a 5 Fr open-end ureteral catheter was placed into the ureter under fluoroscopic guidance with the patient under general anesthesia in a modified supine lithotomy position. Later, the patient was taken to the prone position. Under fluoroscopic guidance, percutaneous access was achieved with 18-gauge needles. A 0.035 inch J ended guidewire was introduced to the collective system via a needle. Dilation was achieved up to 30 Fr via Amplatz dilators. Later, a rigid nephroscope (26 Fr, Karl Storz®) was placed. Upon accessing the stone, fragmentation was achieved via a pneumatic lithotripter (Lithoclast; EMS, Nyon, Switzerland). The stones broken via the lithotripsy method were removed via forceps. According to the decision of the surgeon, due to intraoperative conditions, a JJ stent was placed intraoperatively. Percutaneous nephrostomy was performed until the end of the procedure. The time from the beginning of the endoscopy until the placement of the percutaneous nephrostomy was calculated as the operative time. The success of the operation was assessed via fluoroscopy in the operating room at the end of the operation, and via KUB and US on the 1st postoperative day. Detection of no stone or a residual fragment of <3 was considered success. JJ stents were removed three weeks later. Second session operation was performed in patients whose stones were not fragmented at the end of the operation or patients who had residual stones. Complications were assessed according to the Clavien-Dindo classification (7). The data were analyzed with SPSS for Windows 16.0 package program. Numerical measurement values were tested for normal distribution using the one sample Kolmogorov-Smirnov test. The difference in parameters, including gender, kidney anomaly, stone laterality, location, JJ stent usage, opacity, success and complications, between the two groups was analyzed using the Pearson chi-square test. The difference in age between the two groups was tested using Student’s t-test. The difference in parameters, including stone number, stone burden, operative time, fluoroscopy time and length of hospital stay, between two groups was analyzed using the Mann-Whitney U test. A p value of less than 0.05 was considered statistically significant. 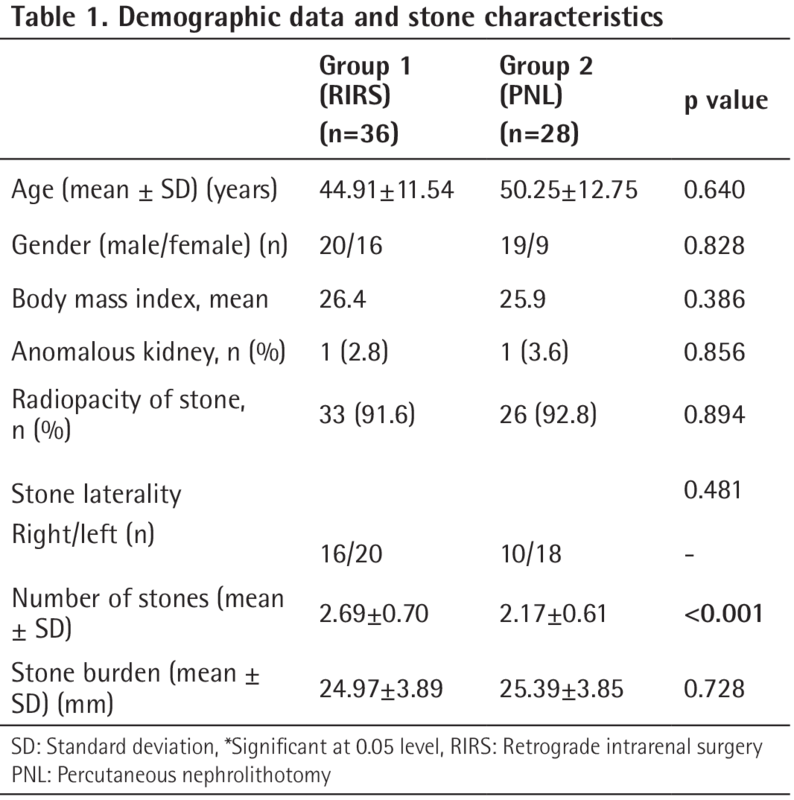 When the demographic data and stone characteristics of the groups were examined, no statistically significant difference was detected in age, gender, stone radiopacity, stone laterality and stone burden between patients who underwent RIRS and PNL. When the groups were compared for body mass index (BMI), it was observed that the BMI value in RIRS and PNL groups was 26.4 and 25.9, respectively. The number of stones was statistically significantly higher in the RIRS group (Table 1). Three patients had a BMI value of >30, five patients had a high operative risk according to the American Society of Anesthesiologists physical status classification system and four patients had a history of antiplatelet use. Therefore, RIRS was performed in these patients. Operative time, fluoroscopy time and length of hospital stay were significantly shorter in RIRS group than in PNL group. The mean access number per procedure was found to be 1.39 in PNL group. Eleven patients required double access. The stone-free rate was higher in PNL group than in RIRS group. However, there was no statistically significant difference (Table 2). When the complications were examined, the rate of minor complications was higher in PNL group. No statistically significant difference was observed between the groups. 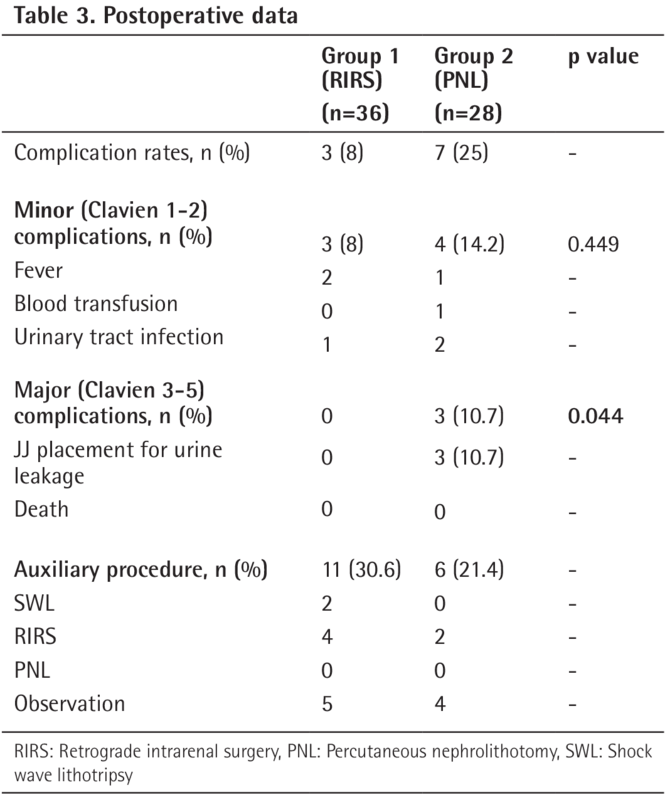 In PNL group, the number of major complications was statistically significantly higher than in RIRS group (Table 3). In RIRS group, as an additional intervention, shock-wave lithotripsy was performed in 2 patients after an unsuccessful RIRS. Also 2nd-session RIRS was performed in 4 patients. Additionally, five patients were followed up. In PNL group, as an additional intervention, RIRS was performed in 2 patients following an unsuccessful PNL. Four patients were followed up (Table 3). In urology practice, multiple kidney stones are seen among patients with a rate of 20-25%. Studies on the employment of PNL and RIRS methods in multiple kidney stones are available in the literature (8,9,10). However, there is no study comparing the efficiency or reliability of these two methods in the treatment of multicalyceal stones. Although the number of patients was low, this is the first study to compare these two methods in the management of multicalyceal stones measuring 2-3 cm. The primarily recommended method in patients with a stone size larger than 2 cm is PNL (4). In a study which compared PNL and laparoscopic pyelolithotomy methods, PNL was performed in 39 patients with ≥2 cm kidney stones and the duration of operation and length of hospital stay was reported to be 110±54.6 minutes and 4.76±1.60 days, respectively. The success rate was 64.1% (8). In another study, the stone-free rate in single access PNL for multiple kidney stones was found to be 94.1% (11). In a study including 149 patients who underwent multiple access PNL, Singla et al. (12) reported a stone-free rate of 70.7%. In our study, in PNL group, the mean operative time and length of hospital stay were found to be 82.32±34.06 minutes and 4±1.44 days, respectively. Indwelling ureteral catheterization and turning the patient into the prone position caused longer operative time and removing percutaneous nephrostomy before the patient’s discharge caused longer hospitalization periods. Group 1 patients had a higher number of stones, but when the stone burden was compared between the groups, group 2 had a higher stone burden even though it was not statistically significant. Therefore, we assume that the operative time in the group 2 was longer because the time to the entry into the collecting system was longer in group 2. The overall stone-free rate was 78.6% and the success rate was 82.1%. No statistically significant difference was found in success rate between the PNL and RIRS groups. In their study including 48 patients with multiple kidney stones who were treated with RIRS, Alkan et al. (9) reported a stone-free rate of 100% and 84% in 23 patients with a stone burden less than 2 cm and 25 patients with a stone burden greater than 2 cm, respectively. Minor complications were observed in 6 patients (9). A study conducted by Breda et al. (10) RIRS method was used in 27 patients with multiple kidney stones ≥2 cm. After the first treatment, stone-free rate was reported as 52% and after two procedures, the total stone-free rate was reported as 85.1%. The overall complication rate was 13.6%. Takazawa et al. (13) reported a stone-free rate of 69% and 84.6%, respectively following the 1st and 2nd sessions in patients with ≥2 cm multiple kidney stones. We found a stone-free rate of 69.4% and complication rate of 8% in RIRS group. While double J stent placement rate was 86.1% in RIRS group, this rate was found to be 28.6% in PNL group. Serious complications are observed in patients undergoing PNL. This method requires multiple accesses for multiple stones, which increases the risk of complications. A study in the literature indicated that fever (21-32.1%), blood transfusion (11.2-17.5%), extravasation of urine (7.2%), sepsis (0.3-4.7%), colon injury (0.2-0.8%), pleural injury (0.3-1%), perioperative mortality (0.3-0.78%) can be seen during and after PNL (14). In our study, minor complications were seen in 4 patients and major complications were seen in 3 patients in PNL group. The complication rate was statistically significantly higher in PNL group. This was the result of the need for multiple access in PNL operation. In RIRS, the rate of complication is between 6% and 16% (15,16). The most commonly reported complications include urinary system infection, minor ureteral injury, hematuria and postoperative renal colic (10,15,16). In our study, no major complication was observed in RIRS group. However, minor complications were seen in 3 patients. Two patients had fever and 1 patient had urinary tract infection. In our study, operative time, duration of fluoroscopy and length of hospital stay were found to be longer in PNL group than in RIRS group. 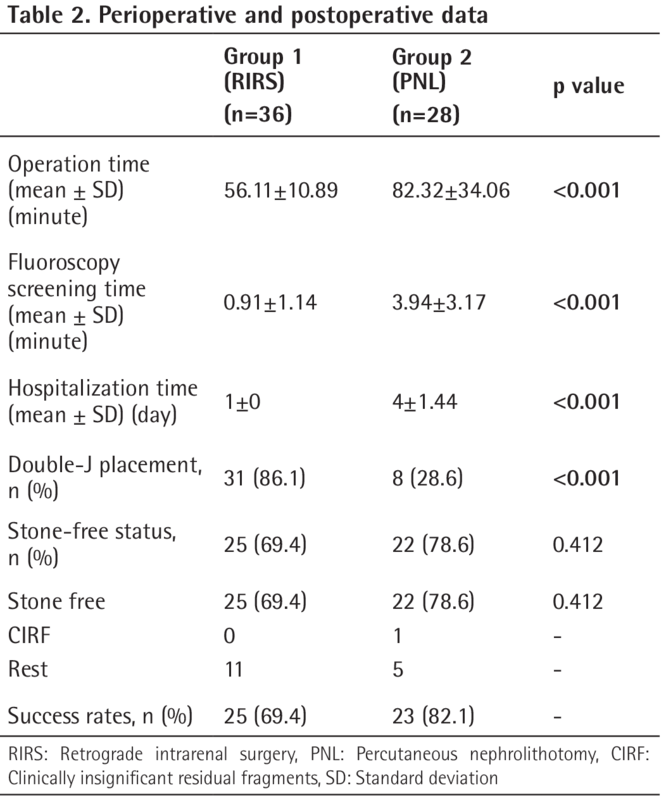 In the literature, there is only one study available reporting shorter operative time in RIRS than PNL for stones larger than 2 cm (17). However, in comparison of RIRS and PNL, multicaliceal stones 2-3 cm in size were not distinguished in other studies. The time required for multiple percutaneous accesses in multicalyceal stones extended the duration of fluoroscopy and operative time in PNL group. Advances in flexible renoscopy and laser technology and growing experience have also shortened operative time in RIRS. In our study, the time required for the withdrawal of percutaneous nephrostomy extended the length of hospital stay in PNL group. Our study has some limitations. Retrospective design and the low number of the patients included in the study are among the limitations. Our clinic is a center that works intensely for urolithiasis. However, the number of patients was limited due to the retrospective design of the study and the patients in the study were a specific subgroup under the title of urolithiasis. Further prospective studies with larger sample size are needed. As a result, in the treatment of 2-3 cm multicalyceal stones, PNL is the primary method to be selected. In patients with comorbidity who have higher risks associated with anesthesia and, bleeding disorder and, those with anatomic abnormalities who are not suitable for PNL, in order to reduce the number of potential complications, RIRS is a method that should be used. In addition, considering the greater rate of major complications associated with PNL, as well as multiple access, we observed that RIRS was a more reliable method in the treatment of 2-3 cm multicalyceal kidney stones. Informed Consent: The informed consent form of the patients regarding the procedure was taken preoperatively. Surgical and Medical Practices: M.Ç.Ç., S.S., H.U.Ö., E.H., Concept: M.Ç.Ç., S.S., N.K., Design: M.Ç.Ç., S.S., H.U.Ö., Data Collection or Processing: M.Ç.Ç., S.S., H.U.Ö., E.H., Analysis or Interpretation: M.Ç.Ç., N.K., L.S., H.T., H.E., Literature Search: M.Ç.Ç., S.S., N.K., H.T., Writing: M.Ç.Ç., S.S., L.S., H.E. Bagley DH. Expanding role of ureteroscopy and laser lithotripsy for treatment of proximal ureteral and intrarenal calculi. Curr Opin Urol 2002;12:277-280. Zengin K, Tanik S, Karakoyunlu N, Sener NC, Albayrak S, Tuygun C, Bakirtas H, Imamoglu MA, Gurdal M. Retrograde Intrarenal Surgery versus Percutaneous Lithotripsy to Treat Renal Stones 2-3 cm in diameter. Biomed Res Int 2015;2015:914231. Lim SH, Jeong BC, Seo SI, Jeon SS, Han DH. Treatment outcomes of retrograde intrarenal surgery for renal stones and predictive factors of stone-free. Korean J Urol 2010;51:777-782. Türk C, Knoll T, Petrik A, Sarica K, Skolarikos A, Straub M, Seitz C, Dabestani S, Drake T, Grivas N, Ruhayel Y, Tepeler AK. Guidelines EAU Guidelines on Urolithiasis© European Association of Urology 2016, Urolithiasis - Limited Update March 2016 Uroweb: http://uroweb.org/guideline/urolithiasis/. Auge BK, Dahm P, Wu NZ, Preminger GM. Ureteroscopic management of lower-pole renal calculi: technique of calculus displacement. J Endourol 2001;15:835-838. Stoller ML, Wolf JS Jr, St Lezin MA. Estimated blood loss and transfusion rates associated with percutaneous nephrolithotomy. J Urol 1994;152:1977-1981. Lee JW, Cho SY, Jeong CW, Yu J, Son H, Jeong H, Oh SJ, Kim HH, Lee SB. Comparison of surgical outcomes between laparoscopic pyelolithotomy and percutaneous nephrolithotomy in patients with multiple renal stones in various parts of the pelvocalyceal system. J Laparoendosc Adv Surg Tech A 2014;24:634-639. Alkan E, Ozkanli O, Avci E, Turan M, Başar MM, Acar O, Balbay MD. Effectiveness of Flexible Ureterorenoscopy and Laser Lithotripsy for Multiple Unilateral Intrarenal Stones Smaller Than 2 cm. Adv Urol 2014;2014:314954. Breda A, Ogunyemi O, Leppert JT, Schulam PG. Flexible ureteroscopy and laser lithotripsy for multiple unilateral intrarenal stones. Eur Urol 2009;55:1190-1196. Shalaby MM, Abdalla MA, Aboul-Ella HA, El-Haggagy AM, Abd-Elsayed AA. Single puncture percutaneous nephrolithomy for management of complex renal stones. BMC Res Notes 2009;2:62. Singla M, Srivastava A, Kapoor R, Gupta N, Ansari MS, Dubey D, Kumar A. Aggressive approach to staghorn calculi-safety and efficacy of multiple tracts percutaneous nephrolithotomy. Urology 2008;71:1039-1042. Takazawa R, Kitayama S, Tsujii T. Single-session ureteroscopy with holmium laser lithotripsy for multiple stones. Int J Urol 2012;19:1118-1121. Michel MS, Trojan L, Rassweiler JJ. Complications in percutaneous nephrolithotomy. Eur Urol 2007;51:899-906. Stav K, Cooper A, Zisman A, Leibovici D, Lindner A, Siegel YI. Retrograde intrarenal lithotripsy outcome after failure of shock wave lithotripsy. J Urol 2003;170:2198-2201. Fabrizio MD, Behari A, Bagley DH. Ureteroscopic management of intrarenal calculi. J Urol 1998;159:1139-1143. Bryniarski P, Paradysz A, Zyczkowski M, Kupilas A, Nowakowski K, Bogacki R. A randomized controlled study to analyze the safety and efficacy of percutaneous nephrolithotripsy and retrograde intrarenal surgery in the management of renal stones more than 2 cm in diameter. J Endourol 2012;26:52-57.